Ahhhh... I don't know which is cuter, Oscar or his vest! Sooo cute! He is very handsome in his adorable vest. I love how the blue of his eyes picks up the blue in the yarn and the green pants and leaves do the same for the greens in the yarn. Stunning all around! This is just too too cute. I love the colours but my goodness what beautiful eyes he has. Ohmigosh, Oscar is so cute!!! Love the vest. It fits perfectly, and the colors are awesome for him! That is a great vest pattern! I made so many vests for my children when they were young. They all wore like iron and I have a friend who is still using some of the vests I made! (that is amazing to me since the children who wore those particular vests are 18 and 20 now! )I always seemed to add extra length as well. VERY cute model you've got there!!!! So sweet! Nice vest and little boy. Gorgeous. Sweet little boy you have there. Really cute! Cute model, too! Just surfed in from Cari's blog- gorgeous colors! And such a handsome little boy! Hi, Kellie - thanks for the comments! I don't think that the Rum Runners will pool...they are VERY well dyed. I had no issues at all. I knit mine toe up, so they are 56 stitches then increased to 60 at the cuff. I did try a picot edge and I wasn't happy with it, but that is just me. Hon, Heartbreakingly cute is an understatement! 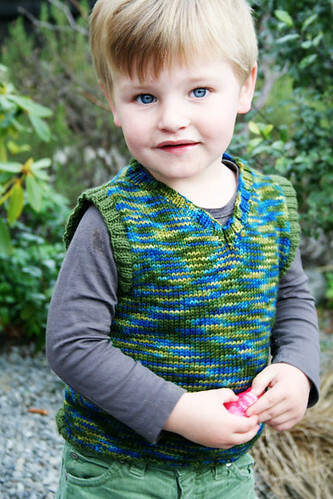 I jsut wanted to stop by and say thanks for the kind words regarding my pattern in Magknits! Girlfriend! I had a dream about you last night... then I realized how long it has been since we last talked. I am so anxiously waiting for you to come visit Melbourne! Please refresh my memory... when are you coming again? Oh the joy of anticipation!!!!! I miss you girl, and I hope all is well! will you ever blog again ???????????????????????????????????????????????????????????????????????????????????????????????????????????????????????????????????? Girlfriend! It has been soooo long. I have missed you so much! How are you? What's been happening in your life? Please talk to us! Love you!